Your October dose of AMuslimFund! 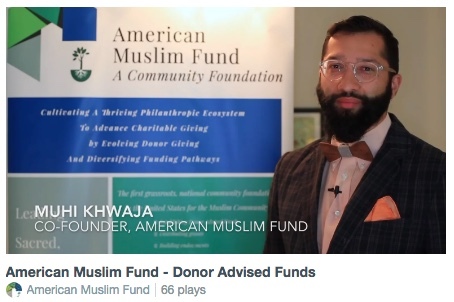 The American Muslim Fund will be featured in a webinar next week on Muslim Philanthropy! This webinar is part of a monthly series hosted by the Foundation Center about diversity, equity and inclusion. The Center maintains the most comprehensive database on U.S. and global grantmakers and their grants — a robust, accessible knowledge bank for the sector. It also operates research, education, and training programs designed to advance knowledge of philanthropy at every level. 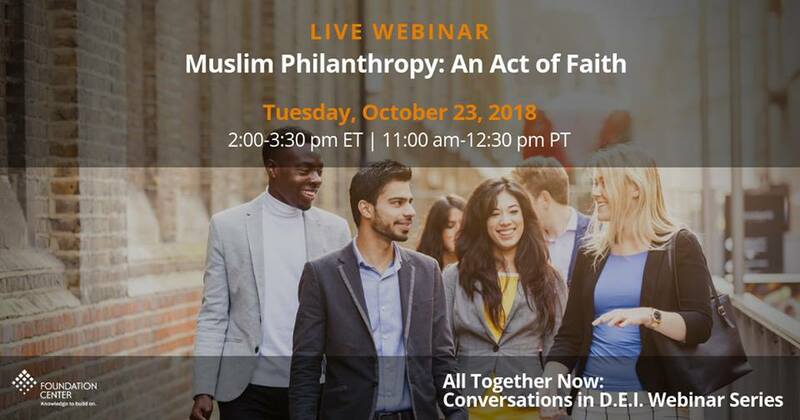 AMF invites you to join our webinar, "Muslim Philanthropy: An Act of Faith". Co-Founders Safaa Ibrahim and Muhi Khwaja will talk about religious philanthropic traditions and charitable practices in Islam. While the webinar is targeted at grantmakers and aims to share insights on how they can best engage the Muslim community in their organization's mission, the website is open to the public and we would love to have your support and participation. Register now for this conversation regarding diversity, equity, and inclusion on Tuesday, October 23 at 11am Pacific! Watch our promo video. Co-Founder, Muhi Khwaja will be visiting New York City, NY from November 2-6, and Southern California November 16-18. If you or your family and friends would like to meet and learn how we can help with your charitable-giving or nonprofit's sustainability, get in touch! Want us to visit your city or present to your board? Just send us a message. Since July 2017, our DAFs have granted nearly $550,000 to 95 organizations. Each gift we make showcases the philanthropic spirit of the Muslim community and increases our goodwill in society. You can help us track Muslim generosity by opening a DAF. Please visit www.AMuslimFund.org/dafs or click the video image below to learn more about DAFs. We have had tremendous organic growth thanks to God's Grace and your generosity. As with any organization, we are looking to expand our impact. By donating, you can help us provide the operational infrastructure to make our vision a reality. IslamInSpanish is an educational non-profit organization that was established to educate Latinos about Islam in the Spanish language after the devastating attacks of 9/11. It was founded by Jaime “Mujahid” Fletcher, a Colombian convert to Islam whose need to share Islam with his father and family led to the discovery that there was no material in the Spanish language. After his father converted 3 months later, both of them--together with his recently converted wife-- all worked together to bring about a balanced understanding of Islam in a culturally relevant manner. This led to the creation of the CD entitled “La Religion de la Verdad” (The Religion of Truth) which became the means for his wife’s aunt embracing Islam before her death from cancer. The first CD was distributed to Spanish-speakers worldwide with great success, with many accepting the tenants of Islam as their new way of life. To date IslamInSpanish produced over 500 audio books, 250+ television shows, and carried out thousands of live events in North and Latin America where thousands of people have embraced Islam. On January 30, 2016, after 15 years of working out of many mosques and traveling in the U.S. and throughout Latin America, IslamInSpanish opened the first Spanish speaking “Centro Islamico” in the city of Houston, Texas. In the 2.5 years since, 140 people have accepted Islam. With a state-of-the-art Production Studio, the organization's multimedia resources have reached over 14 million people worldwide. Their goal is to reach the 500+ million Spanish-speakers that exist worldwide. Today IslamInSpanish represents Muslims in the Spanish language by speaking on mainstream media outlets such as CNN in Spanish, Univision, Telemundo and has been featured on NPR, The Guardian, L.A. Times, AlJazeera, and many other international channels worldwide. 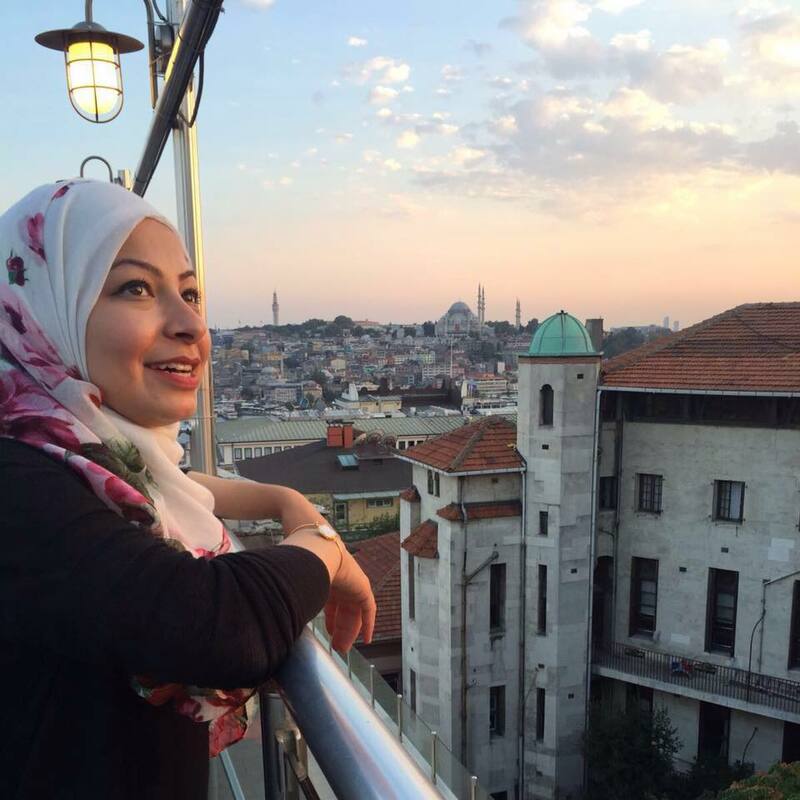 IslamInSpanish's hope is to publicly share the Latino Muslim experience and to help transform lives to inspire people to see the world from the universal lens of “The Creator”. Find more information about IslamInSpanish and watch a Message from Dr. Yasir Qadhi regarding IslamInSpanish to the world. Having worked with many nonprofit organizations through the years, I was really excited to hear more about the American Muslim Fund. A community foundation to me means a collective effort, informed giving, and building together. AMF enables the long term sustainability of nonprofit organizations. The Muslim community has many thriving organizations championing such great causes and those organizations cannot survive without our community investing in institutions like AMF as well. When you support AMF, AMF in turn supports dozens of nonprofits making an impact. In choosing where I donate, I base my decisions on the importance of the mission to me and the impact on society. I'm passionate about empowering and creating mobility for the disenfranchised, building communities of compassion, and making knowledge accessible. When I see the sincerity, commitment, and willingness to put in the work from those behind AMF, it is something I'm happy to invest in. Join me in supporting American Muslim Fund today.